Turrican is a run-and-gun shooter in the vein of Contra or Gunstar Heroes, that was ported over from the Commodore Amiga. The game has a plot, but (as is usually the case) it isn’t important. Your character is a bio-engineered life form that looks a lot more like an android, or at least like Robocop. You can pick up two different weapon power-ups, a spread gun and a laser gun, and various other power-ups and limited-use weapons. You can also morph into a little ball that looks like a table saw blade and roll around the screen killing enemies. 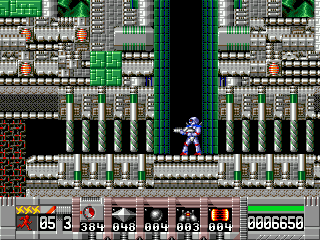 The selection of levels and enemies are varied enough to keep the game interesting, and a couple of the levels right in the middle of the game are vertically-scrolling shooters, helping to switch things up a bit. Turrican’s graphics are more than decent for its age, but where the game really shines is in the audio department. Sporting an excellent soundtrack and great sound effects, games like this are the reason for using the stereo jack on the front of the console instead of the monaural sound that comes out of the back. The problem with the game is that it is too hard for the casual player, and I definitely don’t shy away from a challenge. The designer must have known that the difficulty level was a bit too high, as the game is rife with 1-ups. It’s a real shame, because the environments in the game are great and the level design encourages exploration, but I seriously doubt that the average gamer is willing to stick with this game long enough to enjoy what it has to offer. I played through the entire game using an invincibility cheat code and really had a blast, but it would have been so much more fulfilling to play the game straight and not feel like a dirty rotten cheater. Still, it’s worth checking out as the initial installment in what would end up being one of the best action franchises of the 16-bit generation. It’s really hard for me to give this game a numbered rating because while I personally love it, I totally understand why some people hate it. When I was in high school, my friend John lent me this game and I hung on to it for a good long time, probably because he didn’t want it back. Buy Turrican on GameGavel or Amazon. Tagged Action, genesis, Review, Run & Gun, sega, Turrican. Bookmark the permalink.